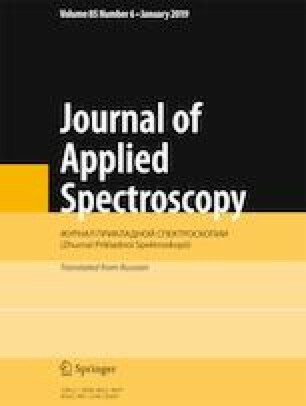 The current study aims at discriminating cotton and woolen textile fibers from dye using UV-Vis spectroscopy and chemometrics methods. For extraction of the dye from fibers, seven solvent systems have been used, and different extraction conditions have also been tested. Two different approaches, i.e., a visual comparison of peaks and chemometric analysis, have been proposed to differentiate between the textile fibers. The comparison of peaks obtained through UV-Vis spectra provides the discrimination power of 83.6% for cotton fibers and 94.3% for the woolen fibers. However, the incorporation of chemometrics has further improved the discrimination power to 100% for cotton and 98.1% for woolen fibers. The discrimination of 100% is achieved with nonsignificant values of the Welch's t-test, which illustrates that all samples are discriminated. Published in Zhurnal Prikladnoi Spektroskopii, Vol. 86, No. 1, pp. 110–115, January–February, 2019.